The aim was to visit my colleagues in Gaza in order to pursue our project to create an original new Arabic stage adaptation of Tolstoy’s War and Peace in Gaza. Now it looks quite unlikely that I will get permission from the Israelis. But I will still be going to the West Bank. … Theatre for Everybody in Gaza have produced a good Arabic translation of a stage adaptation that was produced in the 1950 in Germany. We have presented two events as benefits to finance the work. Both events were at Rich Mix. One in September and the other in January. At both these events there were readings of stage adaptations of Tolstoy’s works and skype conversations with our colleagues in Gaza. The work in Gaza has been held up by the recent ‘war’ and the subsequent ‘peace’. The situation there is dreadful. We thought that if I visited Gaza and worked with Theatre for Everybody it would get things moving and it would help to break down the isolation they feel. I was advised that there might be a way of securing permission to go to Gaza by meeting people in the Palestinian government in Ramallah so when Caryl Churchill said she would like to go to Palestine because she’d never been, I suggested to Ashtar Theatre that we go together and we could do a workshop on her recent play Love and Information. We are going to the West Bank on Saturday 7th February and we will be welcomed and accommodated by the British Council and we are really looking forward to meeting friends old and new there and doing the work on this exciting and challenging play. The purpose of the open letter is to protest the participation of European theatres in a Brand Israel exercise led by Israel’s national theatre, Habima. The ‘Terror Special conference’ is part of ‘TERRORisms’, a two-year project by the Union of Theatres of Europe, under the leadership of its current president, Habima’s Artistic Director Ilan Ronen. 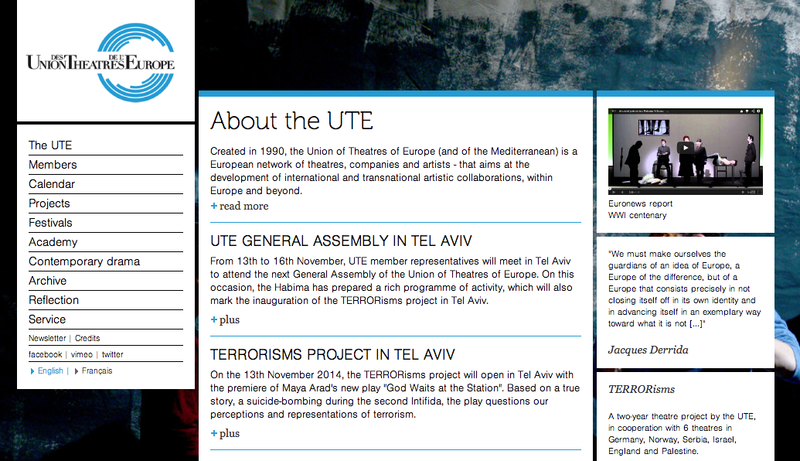 As Habima has boasted, ‘Membership in the UTE is honor and privilege for Israel’s National Theater, the only member not on the European continent, tying Israeli theater to the center of artistic Europe.’ One look at the current homepage of the U.T.E. website tells one a lot about the disproportionate role that Habima – and Israel – play in its 2014 programme.